Carbs, carbs, carbs! Carbohydrates in foods are broken down by our bodies to make glucose which fuels our energy. Complex carbs (carbohydrates) offer more nutritional value than non-complex (refined) carbs. For instance brown rice contains the bran and germ (filled with fiber, magnesium and zinc) that white rice loses in the milling process. Refined or processed white flour (white bread, muffins, etc. ), regular pasta and white rice do not offer the essential fiber, vitamins and minerals that whole grains do. And the best thing about complex carbs is that it makes you feel fuller longer. Fiber-rich foods (complex carbs) help manage blood sugar levels because they release glycogen in your bloodstream little by little and not all at once like simple carbs do. Therefore, your insulin level won’t jump up and down so dramatically. Remember, frequent spikes of insulin level can potentially lead you to type II diabetes. Fiber is also really important for healthy digestion. What goes in must go out- smoothly! We want to avoid constipation and hemorrhoids. Fiber helps the waste process in our bodies. Fruits and vegetables are great sources of complex carbs and fiber. In general, Americans do not eat enough fiber. In fact we only eat half of what is recommended! The FDA (Food and Drug Administration) recommends that we have about 25g to 38g per day. There are so many diets out there that cut out carbs completely. However, moderation is key. For example, white rice should not fill most of our plates. In fact, fruits and veggies should fill half your plate. 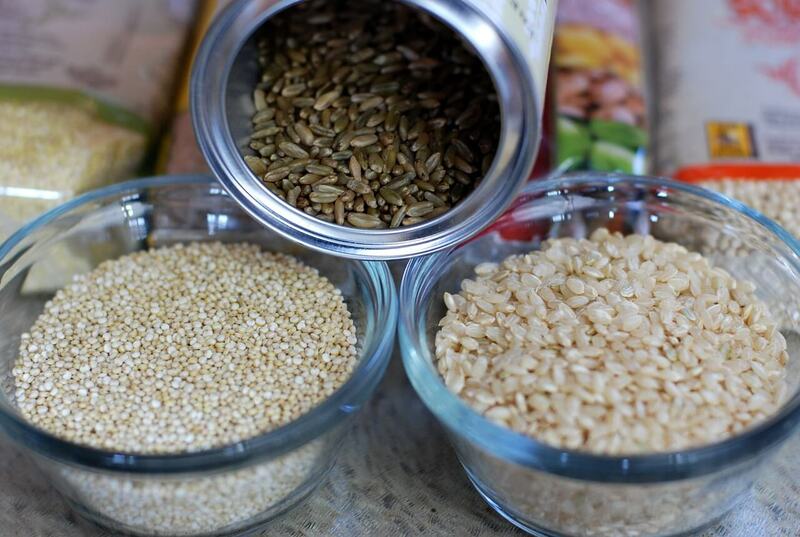 A healthy serving of brown rice is 1 cup – about the size of your fist. Choose whole wheat, multigrain or Ezekiel bread instead of white bread. Choose whole wheat or gluten free pasta (made with quinoa or buckwheat). Opt for steamed, sautéed or grilled veggies instead of rice or potato side dishes. Add berries and nuts to any salad. Opt for sweet potatoes (with skin) instead of mashed potatoes. Steam some peas or green beans versus corn. Eat beans (black, red, pinto, garbanzos, lentils) at least 2-3 a week. Snack on nuts instead of chips. Create a hearty salad with spinach instead of iceberg lettuce.